ES and GOOG both rallied about 2 points today. Both trades are looking ok but will monitor tomorrow. 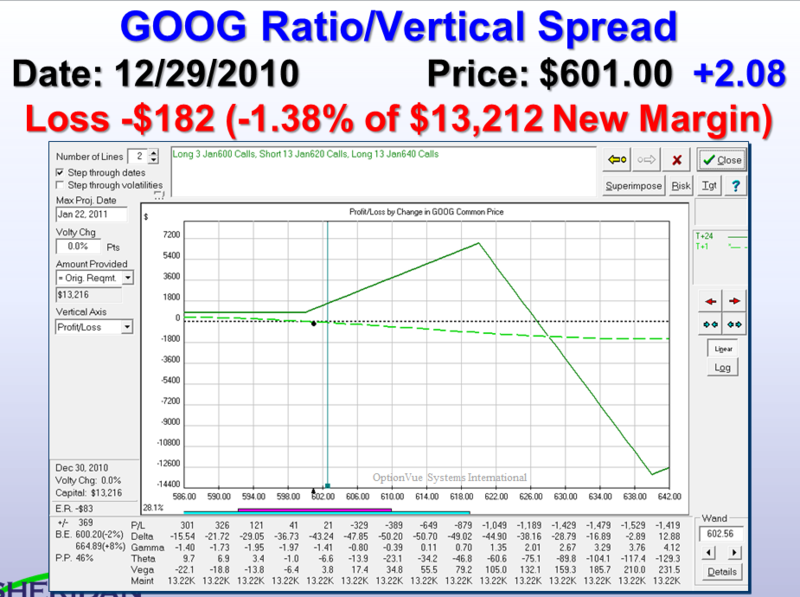 GOOG price looks flat and ES flat to slowing rising which should work ok with our trades as positioned at the moment. 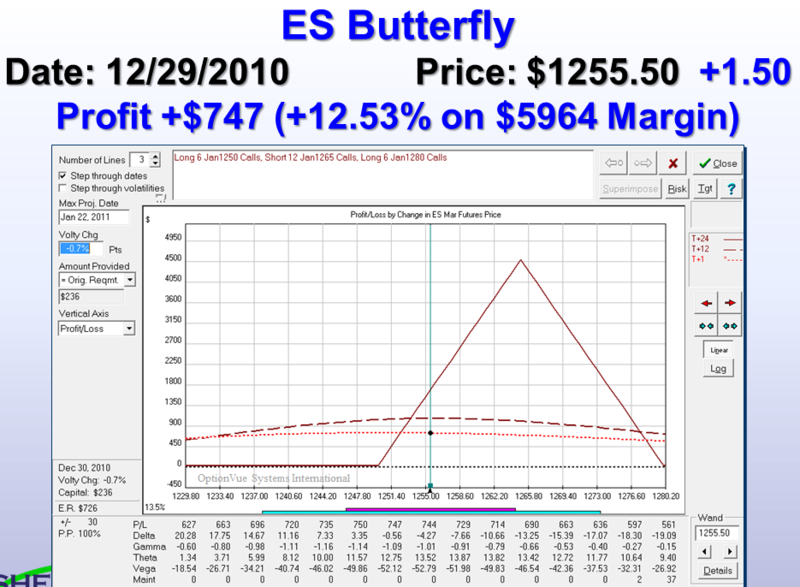 The ES risk graph is a butterfly and we are below the center strike. The only disconcerting thing about GOOG is if we have a 2 standard deviation move up, we would hit our position loss for the portfolio and close everything. Foruntely GOOG has not been moving much lately and I expect that to continue tomorrow. 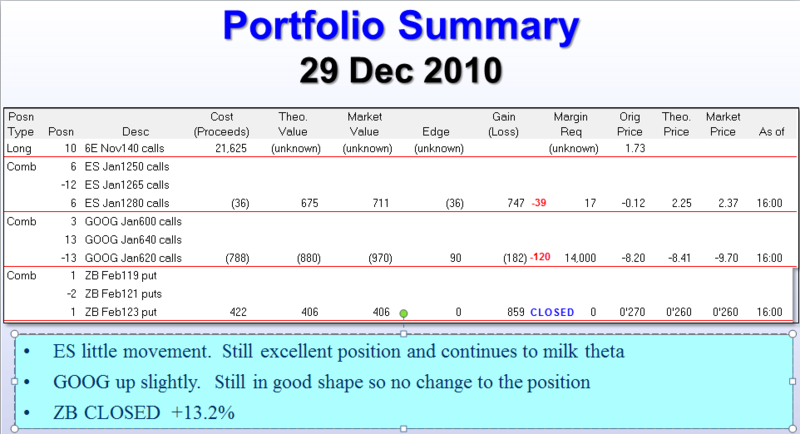 For Risk Management at this point, I’m unwilling to let the trade go below +5% net profit for the portfolio. Therefore, my line in the sand is +$940 of profit. With slippage and commissions, I would bump that up a bit. Let’s say if we get to $1000 profit across all three positions, close all open trades. Jobless Claims report is in the morning but is pre-market. Hopefully it won’t move the market too much. Volumes are low this time of year as many are enjoying the Holidays.